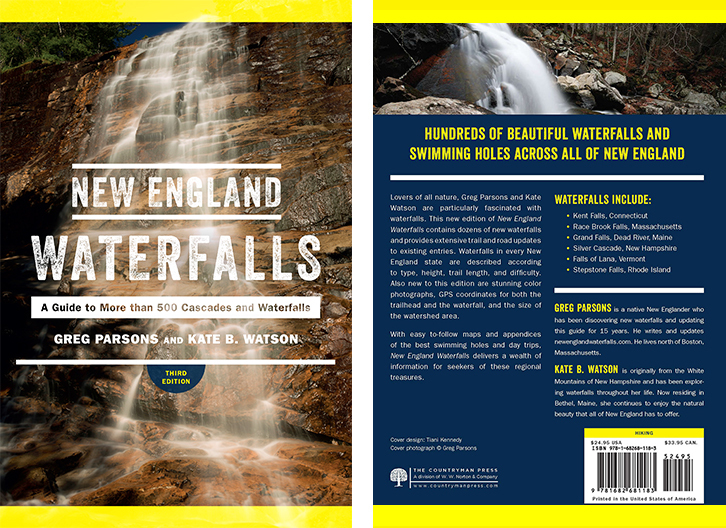 I hope you like rock scrambling, because you can expect a healthy dose of it if you wish to visit these falls. You'll be boulder-hopping and reaching up with both hands as you steadily climb up the "trail". Both the lower and upper falls are somewhat attractive, but you can definitely tell that this is an extremely seasonal stream. Altogether, the stream drops about 80 feet. 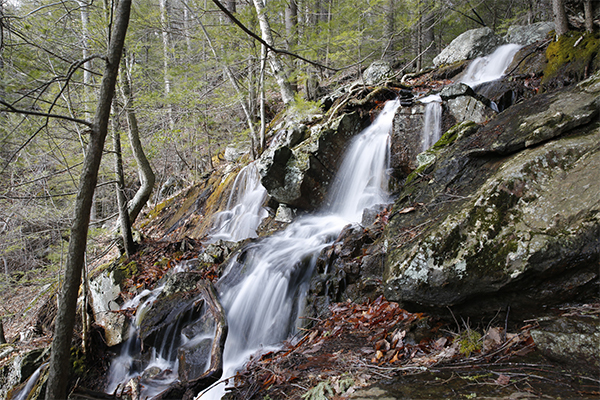 The inherent problem with these falls is that they are at their best during high flow, but that also means that the trail is likely to be very wet with running water in the middle of the trail on some sections. From the parking area, start hiking uphill on the Jessie Gerard Trail. In 75 feet, turn left onto the Falls Cut Off Trail. After about 0.1 mile, you'll reach a boulder and talus rock field that you'll need to start scrambling up. 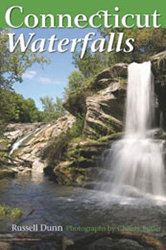 The first falls are only 150 feet further, but you'll start feeling the leg burn as you climb. 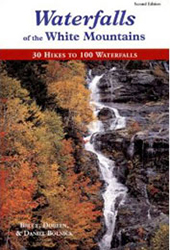 After the initial 50-foot falls, which are reached only 0.15 mile from the trailhead, you can continue further up the trail to more falls. 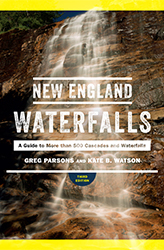 About 500 feet upstream from the lower falls is the 30-foot upper falls. The upper falls are only 0.25 from the trailhead, but it feels more like a mile. 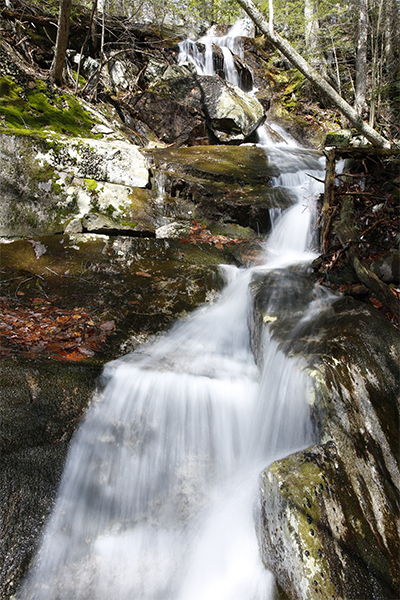 The trail crosses the brook below the upper falls. 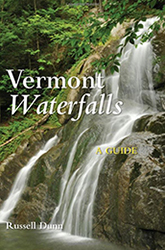 Although I did not check, there may be additional small falls even further upstream. An astounding amount of trail rock work was completed by the CCC to make this trail as safe as possible. However, this is still one of Connecticut's most difficult rock scrambles. 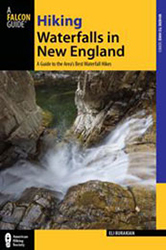 If you have experience scrambling on trails in northern New England (especially trails in the White Mountains of New Hampshire), you likely won't have any issues here. But if you've never done any scrambling before, you are in for a rewarding challenge. Those will an unusually high fear of heights may not enjoy a few portions of this trail. 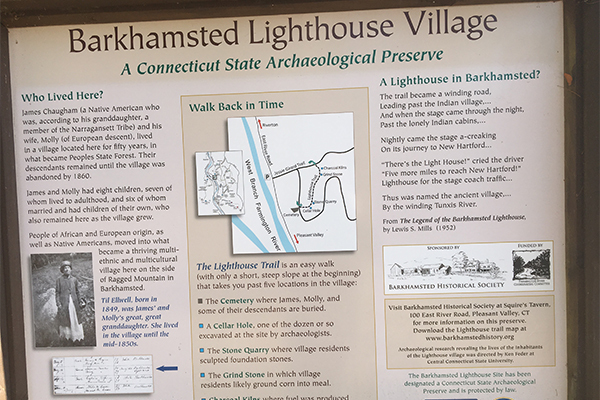 From the junction of US-44 and CT 318 in Barkhamsted, take CT 318 north (traveling in an easterly direction) for 0.7 mile and you'll reach the junction of CT 318 and CT 181. Drive straight through a bridge over the Farmington River and take a left onto East River Rd. Follow East River Rd for 2.4 miles and park in the large dirt parking area on the left. This is the lot for the Jessie Gerard Trail. To get to Barkhamsted, take US-44 west from Hartford or CT 8 north from Torrington to US-44 east.